Vitaminwater recently launched a conversation-starting New Year’s challenge – $100,00 to select participants that could go a full year without using their smartphone. The contest rules stated that participants would receive a 1996-style cell phone and could use work laptops, desktop computers and voice-activated devices but smartphones and tablets were prohibited. 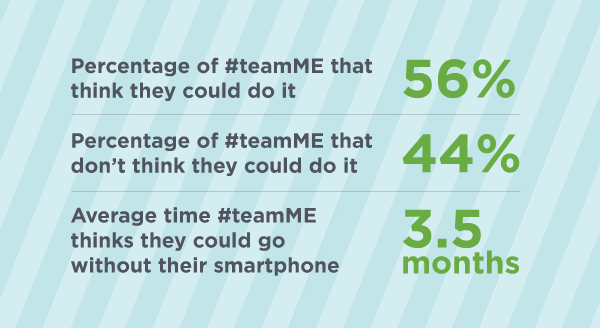 We polled members of #teamME to find out if they could do it, for how long and what they could accomplish in a year without all of the scrollin’ and swipin’. Check out what we said. Could you do it? Not today, but I could when I retire in 10 years or so. If so, how long do you think you could go before using your smartphone/tablet? I couldn’t go more than an hour today, because clients and the ME team need to be able to reach me easily. But when I retire? I could definitely go a year. Or five! What do you think you could accomplish by ditching your smartphone/tablet for a year? I’d exercise more and generally be more relaxed. Could you do it? No, I use my phone to navigate, order food, find out operating hours, review work emails every day…it’s too convenient to have this mobility in a small format that I can carry in my purse or pocket and that works without me having to constantly reconnect to different hotspots or networks. If so, how long do you think you could go before using your smartphone/tablet? I couldn’t do it! What do you think you could accomplish by ditching your smartphone/tablet for a year? I do like to leave my phone at home a lot when out walking or when on vacation. It’s too stressful to jump every time I get a ping which is often unimportant Facebook notices. I also don’t like to have it at the dinner table as it really stifles conversation. We were just talking the other day about how people seem to have lost the art of dialoguing back and forth…can we blame it on the phone or the general lack of manners in our culture? No idea. Could you do it? YES, 100K count me in! If so, how long do you think you could go before using your smartphone/tablet? If I was provided a phone to use, I could go the entire year easily. Considering I can still use my laptop or computer, I would still be able to accomplish my daily tasks on those devices. What do you think you could accomplish by ditching your smartphone/tablet for a year? My phone tells me how much screen time I use daily and it bothers me how much time I waste. Detoxing from my mobile device would be so refreshing and I would probably watch more Netflix…just kidding. My extra time would be used to be more active for sure and I would focus on myself more. Love the idea of traveling without GPS but then again, I should get familiar with smoke signals or how to use flares if I am lost. If so, how long do you think you could go before using your smartphone/tablet? If I did, 1 day. What do you think you could accomplish by ditching your smartphone/tablet for a year? Take more naps, read more books and eat more ice cream. Could you do it? I think I could do it. If so, how long do you think you could go before using your smartphone/tablet? I’ll pull out my crystal ball and say 3 months, maybe 4 – LOL! What do you think you could accomplish by ditching your smartphone/tablet for a year? I’d just use more paper for directions, notes, reminders, etc. Could you do it? Yes. For $100,000? Totally. What do you think you could accomplish by ditching your smartphone/tablet for a year? Before I share, here’s some background: if you have an iPhone, you’re able to access how much time you spend each day on screen time. I typically spend between 2-3 hours a day (I know. yikes!). Taking that into account, if I had an extra 2-3 hours in my day because I wasn’t scrollin’ I would use that time to: 1) take more art classes like pottery or painting; 2) learn how to make wine; 3) plan out my next adventure … maybe Spain? And, finally…I’d probably spend a ton of time “taking the scenic route” while driving because I can’t function without a GPS. Haha! Could you do it? I would like to say yes but it would depend on how I received the $100,000. If it was a one-time payment at the end of the year, no. If I received weekly payments of $1,923.08, yes. If so, how long do you think you could go before using your smartphone/tablet? I would shoot for a year but being realistic not very long. I enjoy the accessibility of information that my phone affords me and don’t feel that the usage of my smartphone hinders my overall productivity. With that being said, if I got past three weeks, I’d be $100,000 richer. What do you think you could accomplish by ditching your smartphone/tablet for a year? I think I would re-discover what it was like as a kid when you had to ride your bike around and knock on your friend’s door’s and ask if they could come outside and play. Could you do it? NOT A CHANCE! If so, how long do you think you could go before using your smartphone/tablet? I bet I could make it through a long-ish work meeting, maybe two hours. I’m anxious just thinking of trying to go THAT long. What do you think you could accomplish by ditching your smartphone/tablet for a year? I think it’s similar to giving up pop, candy and other addictive substances – I’d start with physiological withdraws, and then come out the other side with focus, clarity and a sense of accomplishment for having shaken the habit. That, and I’d be able to conquer the free world. To Rebrand or to Refresh? That is the question. Now, let’s talk about the difference between the two. A refreshed brand should remain a visual connection to the original brand, but dive deeper into the audience, voice, and products. The reason behind a refresh shouldn’t be to keep up with current design trends. It’s more than updating colors and shapes within a logo. It should elevate the brand, while holding true to that brand’s core identity and character. A refresh is appropriate when you want to retain the brand’s values, but open up opportunities to other aspects of business or outreach. Google is great example of a brand refresh. In 2015, Google revamped their brand, giving it a modern look that spoke to its evolving audience. The 1999 serif font was old looking, disproportionate and something that no longer represented such a cutting edge and exciting brand. The Google logo has always been clean, friendly, and approachable. They wanted to retain those characteristics, by keeping the tilt in their “e” and multi-colored quirkiness. However, they needed to bring the mark into the 20th century. 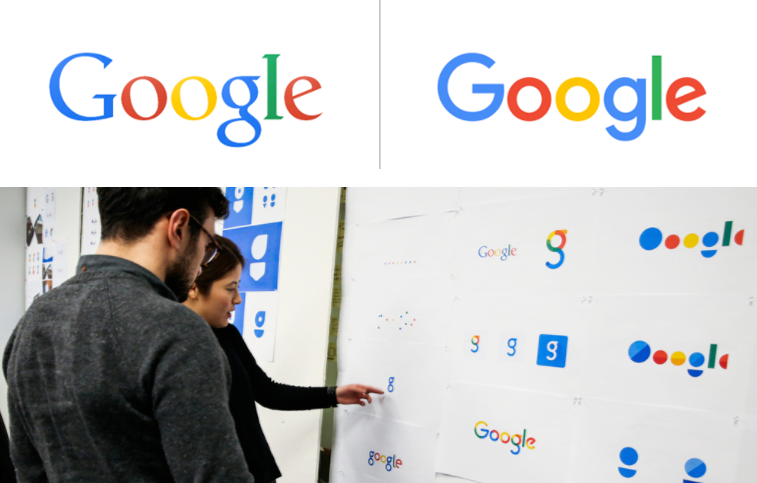 The new round, sans serif letterforms show movement and evolution, something that’s at the core of Google’s brand. A rebrand is a more drastic change. It’s a halt in the current brand, a complete redesign of what the brand stands for and how it is represented. You will lose any brand equity and loyalty that you currently have, with the hopes of creating a better, stronger brand. A surprising factor to some, is that you can keep the logo, and still redefine the entire brand with messaging, imagery, and delivery. I will add that it requires a bigger budget and a longer timeline. It is the right decision though when your brand is no longer able to survive as it is. 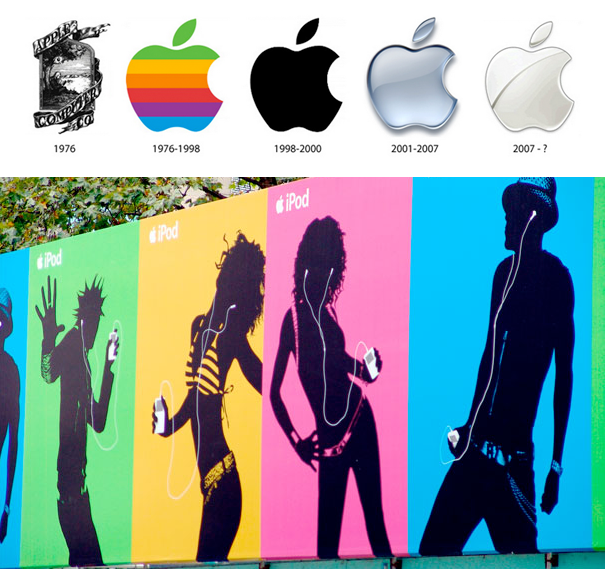 Apple is an example of a successful rebrand that didn’t drastically modify its logo. In the early 1990’s Apple was suffering from low sales, low customer interest, and tons of competition. It didn’t stand out in the market place, because the brand itself didn’t stand for anything unique. When Steve Jobs took back over the company in 1997, he focused on a minimalistic and modern approach, and a series of marketing campaigns that focused on user experience instead of products or purchases. At the time, technology was typically a man’s interest and fashion was women’s. But he combined the two by creating beautiful and imaginative products, packaging, and advertising. Apple was able to create a diverse customer base and show the world that it was not just a computer company, but a product innovator. So now you might be thinking, I need a rebrand or refresh too. You don’t have to be Google or Apple to make a large impact on your audience. Think broader about your brand and how it affects your public appearance, outreach, or profitability. Here at MurphyEpson, helping clients think through this process and identify the best route to elevate their brand is our expertise. Contact us to start the conversation and bring your brand into the new year.